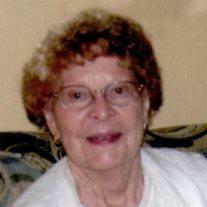 Hortense “Hoot” Orr, 96, passed away peacefully April 25, 2014 in Mesa, AZ. She was born the oldest of 5 children to William C. and Verne Oakden in Beaver, UT and was preceded in death by her dear husband, Lunday “George” Orr and sisters, Katherine and Mary. Hoot spent most of her adult life in Medford, OR, but she and George wintered in Arizona for many years. She loved her family, her church, reading, gardening, visiting, sewing for her grandchildren, dancing with the “Holiday Steppers” and telling stories of her childhood. She will be sorely missed by her 3 children; Connie Fletcher (Darrell), Richard Orr (Darlene), Dale Orr, her 6 grandchildren, 8 great-grandchildren, family and friends. Funeral services are Saturday, May 3, 2014 at 11 AM, preceded by a visitation at 10 AM at the Church of Jesus Christ of Latter-day Saints, 1455N. Harris, Mesa, AZ. 85203. She will be put to rest at the Veterans Memorial Cemetery in Eagle Point, OR. Arrangements by Bunker’s Garden Chapel.